“Condemned to Remember” is an engrossing cinematic journey across Europe in the throes of political, economic and social turmoil. Through the prism of the experiences of an 83-year-old Holocaust survivor “who has seen all there is to see” the tumultuous story of contemporary Europe unfolds. 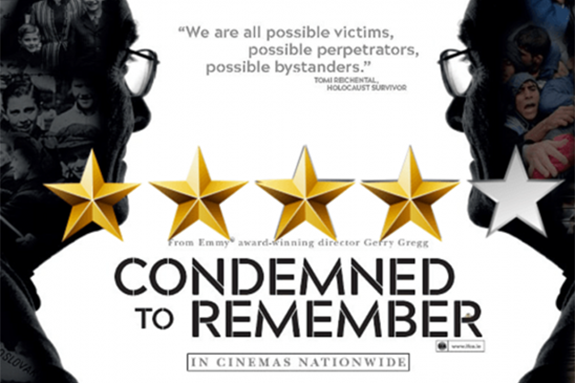 In this epic award-winning feature documentary 83-year-old Holocaust survivor Tomi Reichental discovers that the old atavistic forces of nationalism and xenophobia that destroyed the world of his childhood are on the rise again in Europe. This is just one of the big questions at the heart of “Condemned to Remember”. This cautionary warning about contemporary events is the concluding part of a unique trilogy of films with a remarkable eye witness to the horrors of the 20th Century. Refreshments will be served.